This article is about the item from Witching Gadgets. You may be looking for Golden Thread from Witchery. Golden Thread is an item added by the Witching Gadgets mod. It is a crafting component for several items. "While many great Wizards neglect the practice of spinning and weaving, many of them do that by underestimating its true power. A number of magical artifacts are the product of clothwork, including every thaumaturge's robes. Some witches will testify that spellcrafting in itself even has a lot in common with weaving, requiring careful handling of the respective components; be it raw magic in its aspects or thread. 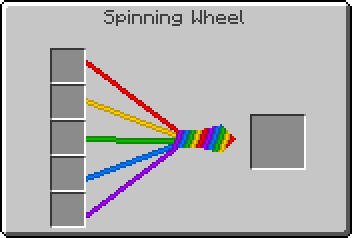 Every practitioners start into the field should be made by creating their very own Spinning Wheel. It will be used if in aquiring yarn, be it mundane, of exquisite material or some enhanced with magic. This yarn will then later be used to weave the fabric from which to craft various garments or magic artifacts." This page was last modified on 10 September 2016, at 21:30.